This was one of those times when I took a picture and caught something I didn’t plan to see. I was watering a little and saw the blue or pale green dragonfly. The others I caught before were brown. Except for the really blue, blue butterfly. So I had to get a shot. I ran back in the house, and then began shooting him, took it in the house, and cropped it and here he is preying on the aphids, but see another beneficial bug ready to prey on him? I hope the dragonfly flew away. They’re both good bugs. I don’t want them eating each other! When I came back to turn off the water, both were gone. So I’m going to assume they both lived happily ever after. And are still voraciously eating the bad bugs. 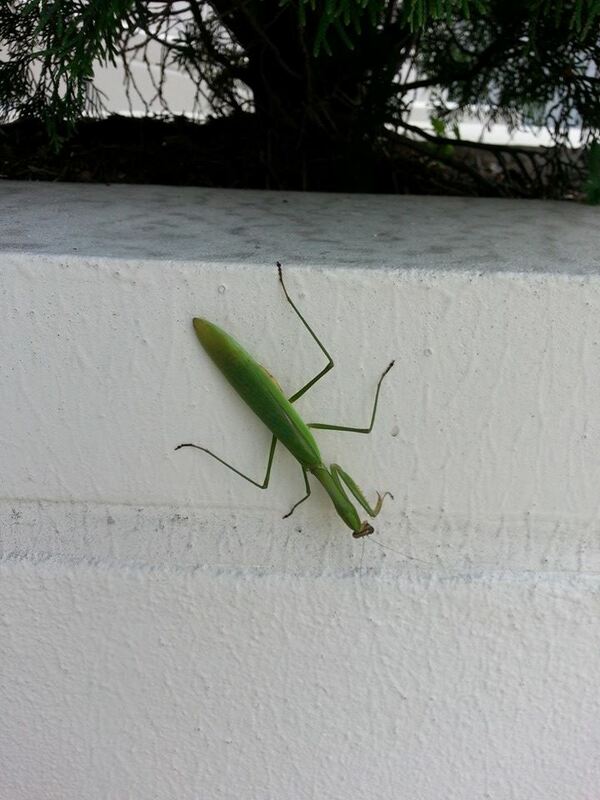 This is the picture of the praying mantis in Charlotte. I had said I didn’t think I’d ever seen one in my yard before. Well, I still hadn’t, if I hadn’t taken this macro shot of the dragonfly. It truly is a very buggy world out here. Although, the population of yellow jackets is very small now. That’s because of THE BIRDS. HER HIGHLAND HERO by Terry Spear is an incredible Scottish romance laced with intrigue, suspense and danger with a very satisfying ending that left me positively beaming. I literally could not put this book down once I started it; I stayed up well past my bedtime finishing it but it was well worth it! It was PERFECT! LOVE, LOVE, LOVE! HER HIGHLAND HERO is the sixth book in Terry’s The Highlanders series; however, as with all of Terry’s books, even though there are interconnected characters, each book can be fully enjoyed as a standalone. Even though not necessary, I highly recommend reading every book in this series as they are all fantastic. ← Building a Business–1 Book, 1 Bear at a Time!